In 1985, then up-and-coming writer Peter David penned “The Death of Jean DeWolff.” Published in Peter Parker, The Spectacular Spider-Man #107-110, the four part story began with the discovery of the titular death of Police Captain Jean DeWolff, a once quite prominent Spider-Man supporting cast-member. It was rather ground breaking at the time of its publication, shifting the overall tone of the book, and helping to pave the way not only for longer form storytelling, but also darker stories, all within the confines of the mainstream Marvel universe. 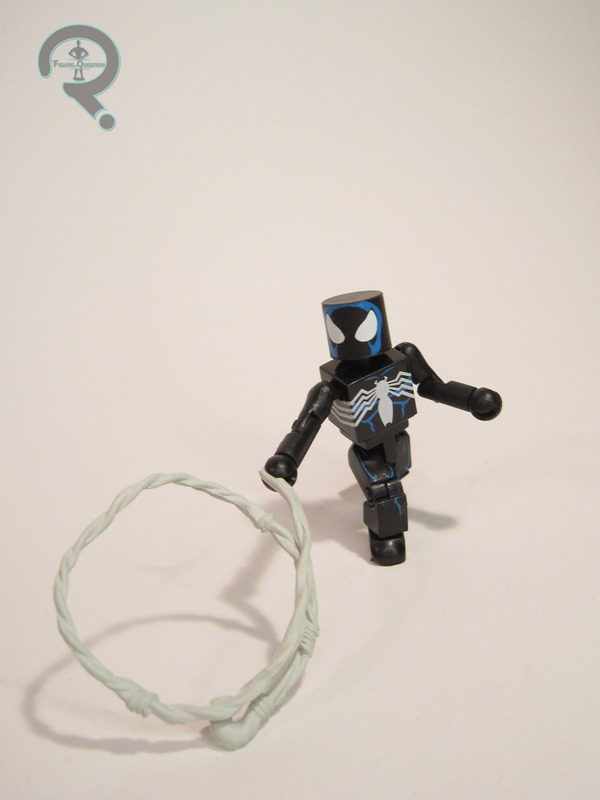 In 2012, the story was used as the basis for the 43rd Series of Marvel Minimates. The first of those sets includes Jean DeWolff herself, alongside Spider-Man. 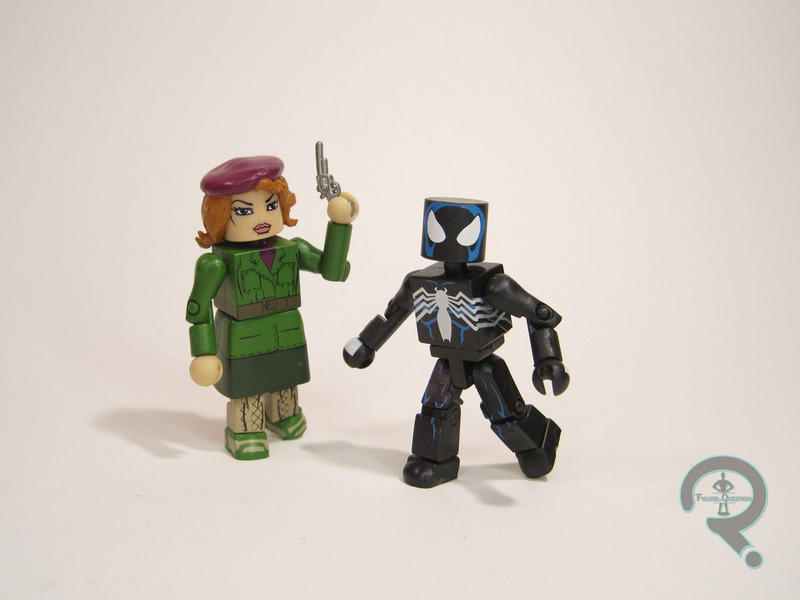 These two are a pair from the aforementioned Series 43 of Marvel Minimates, dubbed the “Jean DeWolff Saga” by a label on the upper right side of the box. Though he had at this point ditched the actual symbiote, Peter Parker was still wearing his cloth replica of his black costume at the time of this story. It’s fairly fortunate, really, as it better fit the more film noir stylings of the story. In a meta sense, it gave Minimate collectors another chance at the black costumed look; this was the fourth time we’d seen it show up in Minimate form. Unlike the prior release of this costume, which made use of a removable mask, this one returned back to the straight vanilla body, with no add-ons at all. Given the general sleekness of this particular design, it was a definite improvement. The important details are all handled via paint. This figure takes a page out of the Big Time costume’s book, and augment’s Spidey’s two-toned look with a bit of accent work, detailing not only the musculature of his torso and legs, but also granting a slightly more human shape to his head and face. In contrast to the Big Time release, whose accenting seemed a bit too subtle, this figure’s seems perhaps a touch too noticeable; that bright blue really stands out, and perhaps robs the design of some of its more striking elements. Still, it’s far from bad work. Spider-Man was packed with a webline, a fairly standard inclusion. Given that he hit retail shelves at the same time as the Best Of version of the character, it’s a little bit of a shame that he doesn’t also get an unmasked head. Of course, he hit retail shelves at the same time as that figure, so it’s not like an unmasked Peter Parker head was difficult to find. Before becoming the unfortunate victim of the murder that kicks off this story, Jean DeWolff had been a fairly prominent Spider-Man supporting player for about a decade or so. Jean was introduced by Bill Mantlo while working on Marvel Team-Up in the ’70s, as he wanted a supporting cast member to serve as connective tissue from story to story. I suppose in that respect, Jean was something of a prototype for the live-action versions of Phil Coulson and Claire Temple. Jean was always known for her retro sense of fashion, with berets and fishnets and the like; this figure follows that, giving us a look that is a good summation of DeWolff’s classic look. Jean makes use of two sculpted add-on pieces, one new, one old. The new was her hair/beret. It’s a very nicely detailed piece, and manages to make her hat not look totally ridiculous, which is always good with this style of thing. 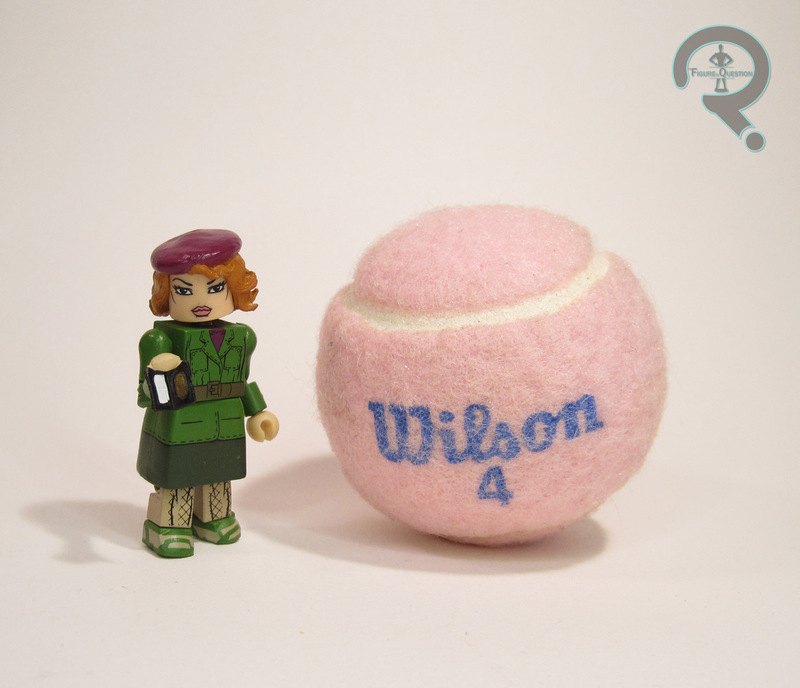 She also uses the knee-length standard skirt piece, first introduced on the Series 17 Gwen Stacy. It’s a fairly basic piece and perhaps a little limiting to the articulation, but it gets the job done. Despite getting more sculpted extras than her pack-mate, Jean doesn’t skimp on the painted details either. The colorscheme is bright and eye-catching, and the detail lines, especially the stitching on her jacket, is some of the best we’ve seen on a Minimate. She’s even got the proper cross-hatching on her legs for her fishnets. That’s definitely a nice touch! Jean is packed with two accessories: a revolver, and an alternate hand holding her badge. The revolver comes from the Dollars sets, and is still a great piece. The badge was originally set to be included in the Beverly Hills Cop set, but with that set’s cancellation, it saw its debut here. It’s always cool to see such pieces find a new home, and given how Jean’s badge factored into the Death of Jean DeWolff, it’s a smart inclusion here. This was an assortment I was quite excited for, so I quite eagerly picked them up from Cosmic Comix when they first showed up at retail. Topping the original Black Costume Spidey is a very steep task indeed, and this one doesn’t quite get there. He’s very close, and definitely the best of the follow-up black costume releases, but that bright blue detailing holds him back ever so slightly. Still, a very strong offering. Jean could have just been a rather forgettable civilian figure, but instead, DST put in the effort to make her one of the best figures in this wave, and certainly the star of this set.